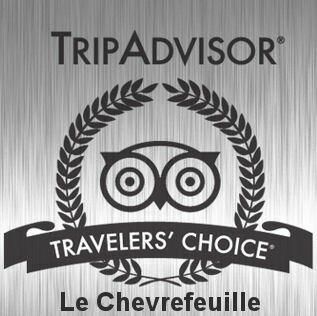 LONDON, U.K. – 18 January 2012 – TripAdvisor, Inc., the world’s largest travel website, today reveals Le Chevrefeuille was chosen as a winner in the bed and breakfast Category by TripAdvisor in its 2012 Travellers’ Choice® awards. Now in its tenth year, the annual TripAdvisor Travellers’ Choice awards honour the world’s best hotels, earning their distinction from those who know them best – real travellers. Unlike any other hotel honours, TripAdvisor Travellers’ Choice winners are based on millions of valuable reviews and opinions from travellers around the world.